Once again a jury just can’t seem to get a verdict correct … because who does not think that politicians act unethically? Crime? No, it’s business as usual. A North Carolina jury that deliberated 9 days in the John Edwards campaign finance corruption case has finally reached a verdict, not guilty on one count and a mistrial on five other counts. This would seem to bring this matter to an end as it would appear unlikely that the prosecutions wants to have another trial on the 5 counts that the jury was deadlocked with. “No one else is responsible for my sins,” he said. “I am responsible. John Edwards said in a statement following the verdict, that he wanted to thank the jury and that they took their job very seriously and were diligent in their duties. Too bad one could not say the same for the shamed former Senator, Democrat Presidential candidate and VP candidate. Edwards stated in a post trial press conference that “God was not through with him”. That may be the case Mr. Edwards, but the American people are. Make no mistake about it, your political career is over, finished, kaput. After you were acquitted from the crimes, no one really wanted to hear your smarmy voice or excuses. You lied to the America people, but more importantly, you lied to your wife who was dying of cancer and cheated on her with another woman and had a baby. A baby that you refused to admit was yours. No matter what the outcome of the verdict, the gig is up and everyone knows what and who you are. People have a strange way of not forgiving those who cheat on their dying wives. Especially one’s who do not seem to learn anything from their short comings. Does anything really surprise us any more when it comes to John Edwards? As reported at the NY Post, former US Senator (NC-D) and Presidential candidate thought ‘Love’ was in the air as he hit on a 25 year old coed at a North Carolina bar just outside of Chapel Hill just months after his wife Elizabeth Edwards died of cancer. Sorry, but in a he said, she said story … Edwards has zero credibility these days. The Blaze seems to question the story that even Edwards has standards. Really? A man cheats on his dying wife … he has none. Horndog hubby John Edwards shamelessly hit on comely co-eds just months after his wife, Elizabeth, died of cancer. Edwards, 58, who is on trial on charges of campaign-finance violations, flexed his trial-lawyer charm on pretty Andrea Love, 25, at the dive Bowbarr just outside of Chapel Hill, NC, last spring. “He was all over her,’’ said a source at the bar. Edwards’ long-suffering wife had just died in December 2010 — and he was reportedly still involved with his mistress, Rielle Hunter, with whom he had fathered a love child. My guess is that he will deny this ever occurred just like he did with the love child that Edwards had with mistress Rielle Hunter. We all know how that turned out when the worst kept secret was finally admitted to by John Edwards. 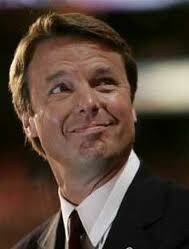 This heel was that close to being President … John Edwards trying to out Clinton, Bill Clinton. John Edwards, facing as much as 30 years in prison and fined as much as $1.5 million, uses the court room as a pick up joint. The term “smarmy” comes to mind. Alternate worlds: What is wrong with some woman? Note to female jurors, I think you can find a better catch than a man who would cheat on his wife and have a baby out of wedlock with his mistress as his wife Elizabeth Edwards was dying of cancer. Add to the mix, John Edwards has obviously learned much from his days of getting caught cheating on his wife. As Memorial Day weekend is upon us, the jurors deliberating in the John Edwards campaign finance case where Edwards is accused of using nearly $1 million in campaign donations to hide his affair with his mistress Rielle Hunter, have been sent home. However, not without some controversy. The judge cleared the court room to discuss what was described as a juror issue. I would appear that a female alternate juror has been flirting with Edwards. Making matters even more sleazy, Edwards has reciprocated the flirtation. It is rather amazing, no make that disgusting, that a man who could not keep it in his pants and is facing felony charges because of it still is such a schmuck that he would think flirting with a juror at his own trial is acceptable behavior. The juror clearly instigated the exchanges. She smiles at him. He smiles politely back at her. She giggles. He blushes. Good grief, what is the issue … send the idiot home for good as this is hardly conduct that should be allowed by an impartial jurist. John Edwards … Does he still feel pretty? My what a difference that an extramarital affair with a former campaign worker, six felony indictment charges and a ruined political career will do to a man’s haircuts. As reported at the NY Post, the Breck Girl John Edwards, has gone from $500 haircuts in Beverly Hills to Supercuts at $12.95. Think that Edward’s legal fees have not cut into his ability to “feel pretty”? After evaluating the two pics above and the associated costs for each haircut, the question that remains is who thinks that the $12.95 Super Cuts hair cut looks better? 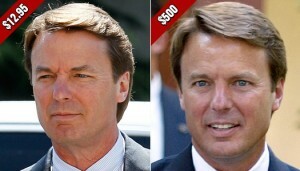 BTW, a note to John Edwards, hair cuts are free in prison. If found guilty of the 6 felony indictment, Edwards could face 30 years for violating campaign-finance laws. Does John Edwards still feel pretty?